The Black woman who was arrested for climbing the Statue of Liberty on July 4th trolled First Lady Melania Trump when she showed up to the Manhattan federal court for a hearing yesterday. Therese Patricia Okoumou made headlines last month when she climbed up to the feet of the Statue of Liberty to protest the separation of illegal immigrant families. 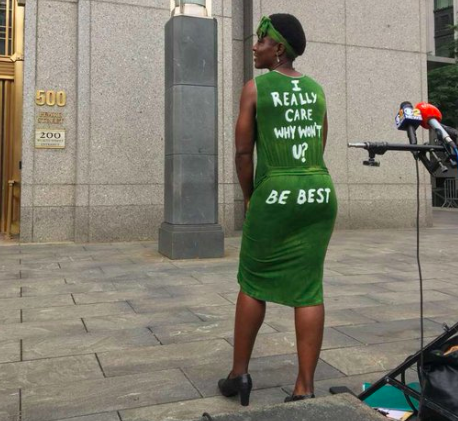 Okoumou’s dress also referenced Melania’s “Be Best” program to promote children’s well-being and battle cyberbullying. In her first court appearance last month, Okoumou also made a statement with her outfit by wearing a black t-shirt with the words “white supremacy is terrorism” printed on it.